On this date in 1848, a pregnant 20-year-old socialite and her forbidden lover were shot at the order of an Argentine dictator. Virtually a lens for the contradictory currents of gender, class and power in her time, Camila O’Gorman was the daughter of an elite family of (as her name suggests) Irish extraction, and a bosom friend of the daughter of her future executioner, dictator Juan Manuel de Rosas. A scandal, as one might suppose — there was much chatter over who seduced whom, and whether it was a kidnapping — but a manhunt (and womanhunt)? Rosas appears psychotically enraged by two young people crazy in love, and still more so for summarily decreeing their death when he had them in his clutches. Another priest, it turned out, handed them over — more in sadness than in anger, in the manner of such folk, but understanding deep down that the arbitrary law is the law and immorality and disorder don’t go about preventing themselves. 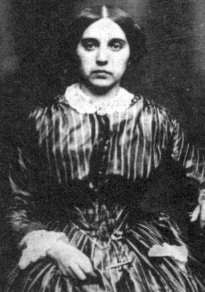 O’Gorman was the first woman executed in independent Argentina, and she was eight months pregnant: the better to “satisfy religion” (though not the law, which forbade the execution of a pregnant woman), O’Gorman’s unborn child was baptized … by making her mother drink holy water. The lovers were then shot together at the town of General San Martín, then known as Santos Lugares de Rosas. 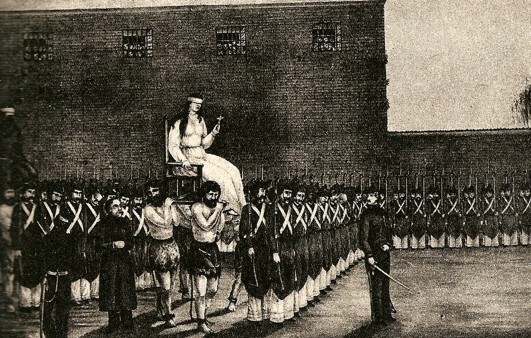 The pregnant O’Gorman, borne to her firing squad. The image comes from this Argentinian page (in Spanish) about the heroine. Camila and Uladislao’s brave sense of freedom upset the structured norms of a society used to obeying through fear. Their only way of facing the tyrannical power was escaping from a society which would never understand. They did not give up on their love to please the Restorer [Rosas], as was expected in those days. They never showed signs of repentment, [sic] on the contrary their peaceful minds reflected their clean consciences. And among the many questions this tragic true story might raise, there’s one that particularly appals [sic] us: why did Rosas shoot Camila knowing the law stated a pregnant woman could not be murdered? Was that baby guilty of his parents’ “crime”? He evidently was, since by being born he would symbolise the testimony not only of the criminal act, but also the evidence of “disobedience” of a moral code imposed by a fearful dictator. Such Shakespearean drama ripped from recent history has not failed to inspire literary treatment — such as Enrique Molina’s Una Sombra Donde Suena Camila O’Gorman, (“A Shadow Where Camila O’Gorman Dreams”) and this 19th century Spanish text.